Half a season gone by and the Mets have been fun to watch, buoyed by outstanding performances by Royally Screwed All-Star Reserves David Wright and R.A. Dickey and a kind of gutsy character that’s resulted in exciting baseball and lots of satisfying wins. In a lot of ways, the Mets are surprising people not because they’ve gotten so much better (though they have, a little) but that the league has come back to them. Clubs like Philadelphia and Miami (LOL and LOL) are exhibiting the kinds of struggles the Mets did in recent years and few clubs in the NL look so good that they could run away from the rest, so I think there’s a little reason to believe the Mets can’t hang around for a while (I think, in fact, lots of teams will hang around for a while). It’s just that kind of year. My concerns are with their weak right-handed hitting, their poor defense and their lack of pitching depth (in that order). 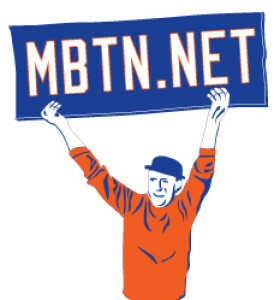 It will take a trade or a miracle comeback from Jason Bay to fix the first issue and continued health and some good luck to fix pitching concerns (I don’t think we have to go nuts trading for some other team’s closer, but bolstering the ready supply of good arms never hurt anyone). It’s the D that I can’t see improving (unless you involve Daniel Murphy and/or Lucas Duda in a trade for that right-handed slugger) and then who knows. But I’d suspect the D will continue to be an issue, so I’m keeping my expectations modest: Let’s hope we can hang around, avoid another big dropoff like we’ve had in so many recent second halves, and see where it gets us. If we can add a bat or an armn, let’s do that too. It’s been fun so far. Speaking of David Wright, his home run July 3 “not only moved him past Howard Johnson into third place in the Mets’ record books, it also moved uniform #5 past #18 for home runs hit. Number 5 now trails only #20 in home runs.” This from sharp-eyed MBTN reader Shorty in the comments section. Sure enough, it checks out: Wright’s dinger was the 378th by a player who wears No. 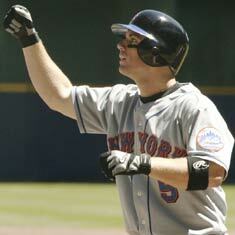 5, surpassing 18, which hasn’t had a home run since Moises Alou in 2007 (thanks for nothing again, Jeremy Reed). Only No. 20, with 388 home runs, has produced more but with that uni currently unassigned it looks like Wright (197 HRs wearing 5) and company (John Olerud is next with 63) can overtake the all-time lead later this year. Re-sign this guy! Getting caught up with the recent roster moves, the Mets designated Justin Hampson and recalled Jordany Valdespin July 4, then swapped out Jeremy Hefner for a healthy-at-last Pedro Beato July 5. Beato was gone so long I forgot what number he wore, but can tell you now it’s still 27. 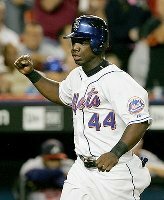 Hampson was later reassigned to Buffalo along with Chris Schwinden, who bounced on the waiver wire to the Indians to the Yankees and back to the Mets. 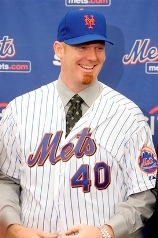 At the press conference this afternoon introducing JJ Putz as a member of the Mets they issued him a jersey with No. 40 on it. That jersey most recently belonged to chubby reserve catcher Robinson Cancel and before that, Ambiorix Burgos who was not offered a contract last week and became a free agent at least in baseball terms. Putz remarked to reporters afterward that he’d ask coach Howard Johnson about the possibility of taking over his No. 20 jersey when the games start this spring. I’d guess HoJo gives the OK, though I’ve always preferred the No. 20 jersey stay on the back of hitters (like HoJo, Agee, Burnitz… and Ken Henderson).It hasn’t been worn by a pitcher since Ricky Bottalicoin 2001 2004 (thanks commenters). As we’d been expecting to see, hitting coach Howard Johnson has cashiered No. 52 and returned to the No. 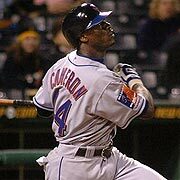 20 jersey he last wore as a Met player 15 years ago. Bullpen coach Guy Conti in the meantime switches from 56 to 52, allowing bullpen pitcher Juan Lopez to take 56. We hadn’t nailed down Lopez previously. Bullpen catcher Dave Racaniello in the meantime was spotted wearing54, as noted below, and catching instructor Sandy Alomar Jr. has slipped into No. 90. These changes have been added to the handyclip-n-save Spring Training Roster above. Many thanks to Bryan, David, Chris and other commenters for the updates. Big thanks also to MetsGrrl for pointing out how difficult it was to get in touch — turns out I’d mistakenly “turned off” the contact link. Duh. Meantime, the conspicuous availability of No. 20 indeed seems to indicate hitting coach Howard Johnson may inherit the jersey before long. We’re still awaiting word of what uni newly named coach Sandy Alomar Jr. suits up in, but it wouldn’t come as a surprise to see Sandy take Hojo’s52, though 54 is also vacant. For the second winter in a row, the Mets traded a soft-tossing starter who wore No. 40 for a hard-throwing young reliever who wears No. 50. While last year it was Jae Seo to Los Angeles for Duaner Sanchez, this time it’s Brian Bannister to Kansas City in exchange for Ambiorix Burgos. (Yes, we know Seo’s turn in No. 40 was a few changes ago, but we couldn’t resist all the spooky parallels). We’ll wish good luck to Bannister, who showed a lot of heart in an unexpected rookie campaign with the Mets, and hope that Burgos can cut down on those home runs allowed and wild pitches. The Winter Meetings also brought word that ex-Met Howard Johnson would serve as the first-base coach next season, with Sandy Alomar crossing the diamond to third base to take the place of the departed Manny Acta. We’ll be watching to see which jersey Hojo turns up in, noting that his former No. 20 belongs today to outfielder Shawn Green. 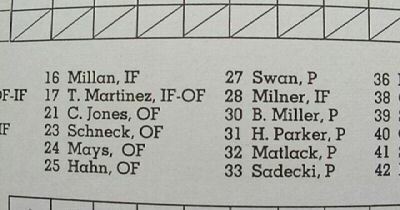 More Numbers Confirmed: Thanks again to Gordon, who mailed along a scan of a scorecard from the opening series of the 1977 season including the listing of Ray Sadecki wearing No. 33. While this number wasn’t especially difficult to remember (that Sadecki wore 33 is in fact about the only thing we can recall of the guy) finding independent confirmation was a bit ornery and so we’re thankful to have it.